V. Rev. Stavrofor Vojislav Dosenovich passed away on 24 October 2008 at the age of 92. He was a Parish priest of St. Nicholas Serbian Orthodox Church in Omaha,NE since 1948 until December of 2005. Hierarchal Liturgy followed with Funeral Service was officiated by His Eminence Metropolitan Christopher on Monday, October 27, 2008 beginning at 9:30 A.M. at St. Nicholas Serbian Orthodox Church in Omaha Nebraska. His Eminence, the metropolitan, was assisted by Proto-Stavrophor Peter Milosevich - St. Louis Deanery Dean, Proto Aleksandar Bugarin of St. George Serbian Orthodox Church in Kansas City, KS, and Fr. Sasa Petrovic, Parish Priest of St. Nicholas Church in Omaha, Nebraska along with other local Orthodox clergy. Tata, no words could express the love, admiration and respect we have for you. From your childhood in Bosnia where you witnessed and survived the war-ravaged region and the unspeakable horrors brought to your immediate family and friends; to your graduation from the Orthodox Theological Seminary in Sarajevo; to your fortunate escape to the United States in 1948. Yours was a youth we could never imagine. By the will of God, you met your wife and our mother Nadine Zeraich. You were ordained to the Holy Priesthood by Bishop Nikolai Velimirovich, who was later canonized by the Serbian Orthodox Church. And finally, you began your legacy at a little parish in Omaha, Nebraska. Continuing the education you received in the former Yugoslavia, you earned M.A. degrees in both Sociology and Psychology from the University of Nebreska at Omaha, followed by Ph. D. studies at the University of Kansas. You served as a spiritual leader making your home at St. Nicholas Serbian Orthodox Church for fifty-seven years. The church you built was far more than a beautiful building. You profoundly touched the lives of so many, often traveling to Des Moines and Kansas City and wherever else your extended flock need you across the country. Humility is a trait ispired by Holy Scripture, and one it would seem that you lived well. Through the blessing of your faith, you humbly administered to as many as five generations of the same family. Truly a testimony of the love and respect and trust passed from great-great-grandparents all the way to the children of today. It is amazing to hear the stories of your life and we treasure all of them. The Rev. Vojislav P. Dosenovich packed a lot of living into his 92 years. The priest at Omaha's St. Nicholas Serbian Orthodox Church for 57 years — he retired just three years ago — died Thursday of complications after surgery last month. He had been in hospice care for a week and a half. A native of Bosnia, Dosenovich graduated from an Orthodox seminary in Sarajevo and attended a theological school in Belgrade before World War II. He came to the United States in 1948 after fighting the Nazis with the Serbian underground. While seeking sponsors for Serbian refugees in this country, he met his wife, Nadine, in St. Louis. After they were married in 1949, the couple moved to Omaha, where he became pastor of the first St. Nicholas Church at 30th and S Streets. The congregation bought land at 50th and Harrison Streets in the 1960s, and the new St. Nicholas Church was completed in 1989, fulfilling her husband's dream, Nadine Dosenovich said. "He was a scholar and a very good priest," she said. "He built his congregation a beautiful church." He earned a master's degree at Omaha University (now the University of Nebraska at Omaha) and a doctorate in Slavic literature from the University of Kansas. 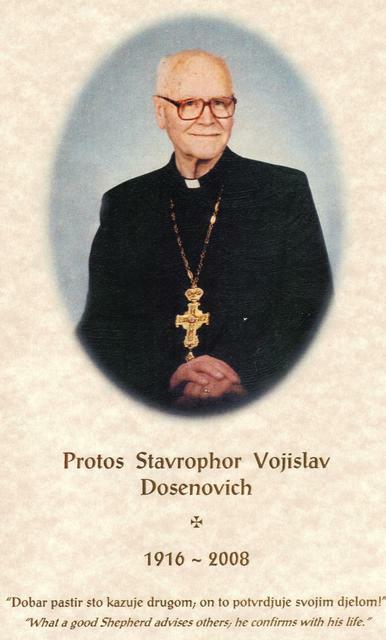 In addition to his priestly duties, his wife said, Dosenovich taught Russian and German at UNO for about 20 years. He taught Latin at Central High School and Russian at Brownell-Talbot and Offutt Air Force Base. "He loved teaching," Nadine Dosenovich said. She said her husband wrote seven books. One of them, "So Help Me God," was an account of his life during World War II. There will be a prayer service and wake at the church at 7 tonight. A holy liturgy will be at 9 a.m. Monday at the church, followed by a funeral at 11 a.m. and burial at Hillcrest Cemetery. Other survivors include daughter Gordana Tosone of Papillion; daughter Mira Jarrett and her husband, David, of College Station, Texas; and three grandchildren. A son, Peter Dosenovich, died three years ago.